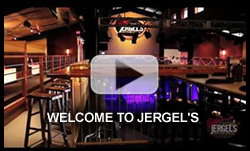 JERGEL’S PARKING IS FREE – If you attend a show at Jergel’s and are charged a parking fee (typically $10), please note that you are being charged by another local business to use their lot. We cannot control the actions of other businesses. The information below applies to all ticketed shows at the venue. Unless a show is specified as “SOLD OUT,”event tickets can still be purchased at the box office – beginning at 6:00 pm – up through and during the show providing the building is not at capacity. If Early Entry (typically 5:00) is not sold out, you can upgrade your General Admission ticket to Early-Entry at the Box Office. If you purchase Early-Entry tickets, YOU ARE GUARANTEED to have a seat for the show (generally only 100 early entry tickets are sold). Seating is limited in the venue and is only available on a first-come, first-served basis. Some seating may have obstructions from other patrons, structural barriers or other unforeseen issues, which we cannot control. There are no table reservations for ticketed events, however, party areas are available throughout the venue for advanced rental. Renting a party area does not include ticket prices and some of the rentable areas do not provide site lines to the stage. No outside food or beverage permitted in the venue. No flash photography, video or audio recordings are permitted without prior approvals. Anyone under 21 must accompanied by a parent or legal guardian unless the show is promoted as an “all-age show”. All patrons with tickets must enter through the front door. The venue is not open for dinner prior to door times. Meet & Greets are at the discretion of the artist or their management. Jergel’s has no control over these situations. Any event ticket that is not a Ticketfly ticket will not be granted access to any show. Third party purchases are not recommended and may not allow you entrance into the venue.